"This popular summery cocktail from the Vig Bar in New York City has a delightfully fresh flavor, thanks to plenty of fresh cucumber, a little lime juice, and some elderflower liqueur." Place 3 ice cubes into a pint glass. Place 4 thick cucumber slices into glass, top with lime juice and simple syrup, and muddle thoroughly until cucumber pieces are juicy and broken up, about 10 seconds. Fill pint glass about 3/4 full of ice; pour gin and elderflower liqueur over ice. Shake gently and strain into a cocktail glass. Add 1 or 2 small pieces of muddled cucumber. Garnish with 1 slice of cucumber and add splash of club soda. Serve with straw. Watch a professional bartender make a summery cucumber and gin cocktail. Refreshing, light, and the perfect summer mixed drink. This recipe is fresh, flavorful and will knock you on your after three of them. 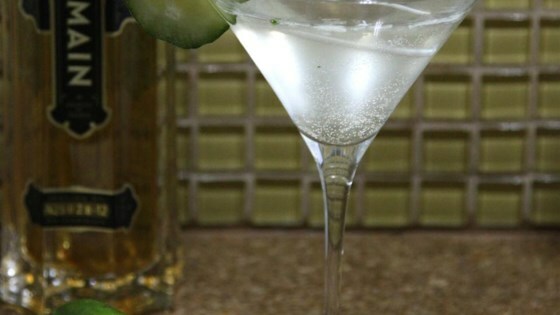 You will especially enjoy this if you like Hendrick's with cucumber.